An image, much-used in finance, government and media, which depicts the perilous position of the United States is: ‘the fiscal cliff”. If, in the next weeks, the USA fails to arrest its great fiscal crisis, and falls over the brink, the repercussions will shake the world. There will be brinks all over the place. A campaign slogan in the recent USA election was: ‘Move forward’. One might have thought that, perched on the brink of a chasm, moving forward is a somewhat chancey direction. 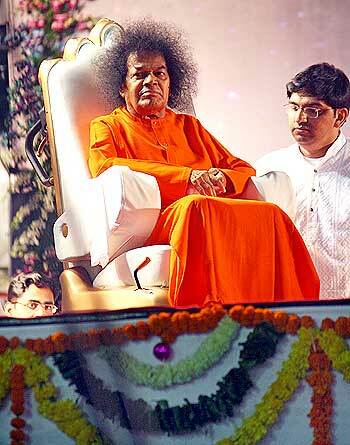 Crises of this magnitude, and greater, Sathya Sai Baba foretold he would solve before he died. He himself went over the brink that he dug for himself and many others. Millions of followers – though dwindling in number since our decade or more of international exposure – still blindly cling to the notion that he will save the world. He hollers: Move forward! But his hoss says: Whoah! Says: I got horse-sense, but you got none! Is it over the brink of the cliff you’d go? You gotta stop-look-‘n,-listen when your horse says: Whoah! Or it’s over the brink you’ll go, oh, oh …. Oh, oh, oh, oh …..
Oh, no no no, Oh, oh oh oh …. You’ll go, go, go ….. In recent years, in blogs or on websites, prominent commentors such as Robert Priddy, Brian Steel and myself, have noted a dizzily steep decline in non-Indian visitors to Sathya Sai Baba’s Puttaparthi ashram. Sathya Sai Baba In Glass Casket. He is Unresurrected – As Yet! …. Around the world, according to a constant stream of travelers’ reports, a great many people have left the Sai Baba cult, including in India. When journalists, scholars and other investigators enquire about this and other aspects, the international Sathya Sai Organization refuse to answer. Because the organization actively interfaces with mainstream civic, political and religious, the chain-mail cloak of secrecy is, of course, reprehensible. Below, I have excerpted from an website-and-newsletter active devotee’s report. Hope springs eternal in those like Ted Henry, as both excerpted and longer version make clear. Touchingly, to feed a longing far deeper than nostalgia, there is great reliance on meetings with old devotees. The ostensibly ‘real’ thing of Sathya Sai Baba’s daily appearances at dashan is missing. There is a grasping at lonely shadows, mistaking the slight play of light for the substance, when even the substance was false, and embodied one of history’s greatest deceivers. Absent is any realistic assessment of the enormous damage to Sai Baba and his cult’s failure to discuss or address the worlwide allegations. 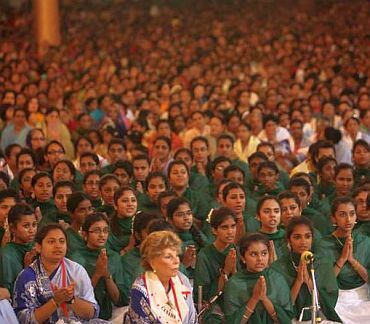 Absent, too, is devotee recollection that those who have spoken out were for long highly respected members of the Sathya Sai Organization, including foremost leaders. Yet the same integrity for which they were known while devotees is the same integrity with which they have dealt with investigating the terrible allegations from round the world. This widespread demeaning of former devotees and other critics cannot, even remotely, be called spiritual. “The problem with Puttaparthi has always been that it functions around Baba. Even when he was alive when he travelled to live in Whitefield in Bangalore or the Kodaikanal ashram, Puttaparthi would become a ghost town. His devotees would follow him. That was our off-season. Now we have a permanent off-season,” says Dhanush, whose family has lived here for over 50 years. A month after Sai Baba’s demise, the flood of visitors has reduced to a mere trickle. A large number of businessmen from Kashmir, Nepal, Tibet and Gujarat had settled in Puttaparthi and were carrying out brisk business for decades. They are concerned about the rapidly declining number of visiting tourists, and are not in a position to pay their monthly shop rents. Real estate business is also affected as no one dares to purchase lands and plots even at cheaper rates, tho-ugh the price for cent land was once Rs 10 lakh. ….. There is a plus/minus to all of this which I hope to detail later. I should tell you quickly that the welcome mat is out for all Westerners to visit the ashram. One of my first stops was to pay a visit with Mr. Unni, the dear mature soul who has headed up accommodations office here for decades. His office was always a beehive of activity with many travelers trying to curry favor for a good room in a good building with working fans and a functional bathroom, maybe even one with hot water. On this day he sat alone in his office, willing to share time with me, something he could rarely afford to do before. The last time I checked with him (it’s my reporter’s instinct) during January, 2009 there were 85,000 people in the ashram from 125 countries, and today, only 7000. He tells me the attendance from people in India remains high, but for foreigners the turn out remains slight since Baba’s passing a year and a half ago. “Please encourage all Westerners to come to Baba’s home. He is here”, he said to me a couple of times. I promised I would do so. Later in the day while walking past the mandir (Sai Baba’s main open air temple that holds 20,000+ people) I felt a discernible let down. Those present for the early chanting were quite few. The mandir is where Baba would give darshan, where he would show his loving presence, twice a day to the multitudes. Since Baba left his body the schedule here has changed and now begins with vedic chants at 4:30, followed by bhajans (devotional singing) at 5:15, followed by darshan at 6 pm. These days during darshan people are permitted to come up to his tomb and pay their respects. I was walking past the mandir doing some initial chores on move-in day. As I looked to my right into the giant hall, this is what a saw, seven Sevadals (ushers) at the front on the men’s side and behind them I counted five devotees in the first line. There was no second line. Throughout the rest of the hall there were maybe 40 to 60 men scattered here and there with lots of empty space around them. Only a long time visitor would know how unusual, and sad this was. Later, I ran in to a good friend, Nooshin Mehrabani, a long time devotee from Iran who has lived here full time for a number of years now. She told me not to worry, that the crowds come later these days and that most people show up when the bhajans begin. She also stressed that Prasanthi Nilayam is a different place, with a different purpose. It used to be that you would come to the ashram to be in the living presence of the highest Avatar, a descendant of the Divine, but now it’s purpose is to serve primarily as a pilgrimage destination. Some of you may recall Nooshin’s name since I posted two video interviews with her on Souljourns (youtube.com/souljourns and vimeo.com/souljourns.) She was a long time television journalist in Iran before moving to Canada and the United States. Nooshin had countless interviews with Baba serving as interpreter for visiting Iranian devotees. More on darshan and the experience of being with Sai Baba in the space many felt most at home with him in the next newsletter when this important subject can be given more time. Being here, inside the mandir at his darshan is THE reason we are here …..